Benefit Cosmetics will launch Gimme Brow, its latest brow product, in October. But until then, I thought I'd show you guys a few quick sneak peeks! Gimme Brow is meant to give you fuller brows with volume, so if you like a bit of drama for your brows, then this product is a good one. Benefit's Gimme Brow: A brow mascara to give your lashes colour and volume! 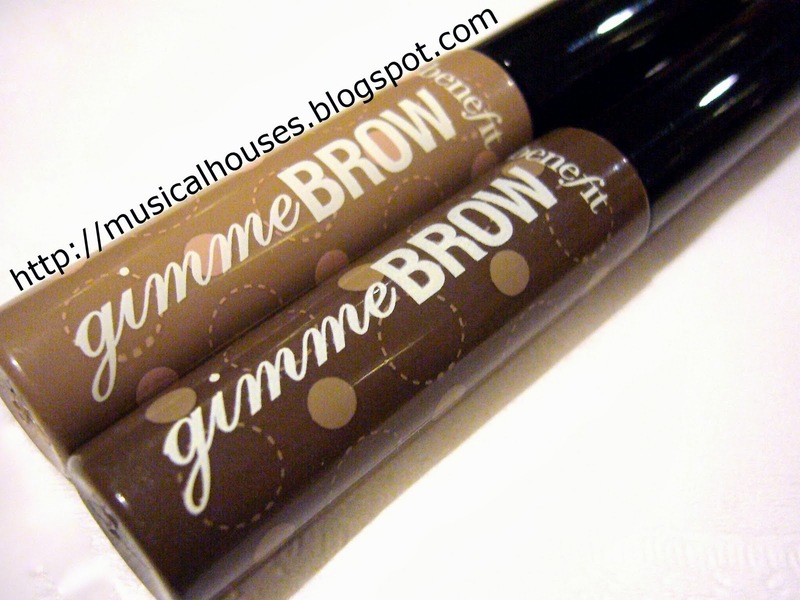 Gimme Brow is essentially a brow mascara, a product which is quite popular in the West. As you might guess, it naturally comes in mascara-like packaging - there is a small tube, and a small, sharp mascara-like brush and wand for application. Benefit's Gimme Brow comes with a mascara-like tube and brush packaging. 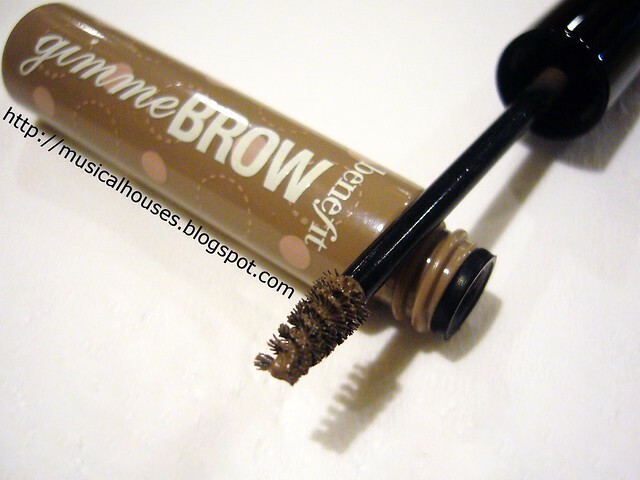 Gimme Brow lives up to its claims of giving you depth and volume quite well. 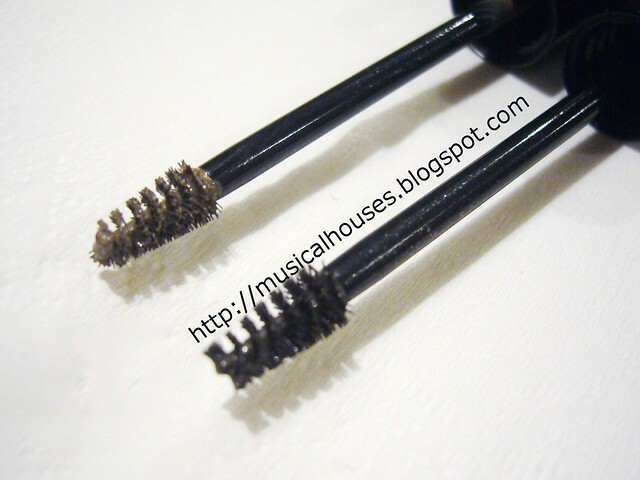 When I tried it out, I found that the small brush really helps when you're trying to maneuver the wand to coat every brow hair. The trick is also partly in the application: for a more natural look, brush the product upwards onto the brush hairs (but not the skin), moving out from the inner corner of your brow, while for a darker, fuller brow, you brush on the product with a pressing motion. The pressing motion will make the colour adhere to the skin for a darker, more defined brow. You can use Gimme Brow in conjunction with Brow Zing (apply Gimme Brow first, then go over with Brow Zing's wax and powder), but my humble opinion is that depending on your brow condition and the look you are going for, you probably could do with just one or the other. The little brushes that Benefit's Gimmie Brow has help to coat every eyebrow hair and really oomph up the volume and drama. 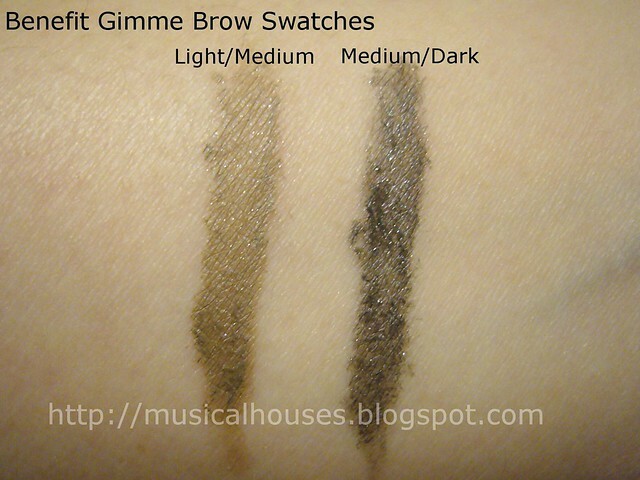 Gimme Brow comes in two shades, Light/Medium and Medium/Dark. Both are great brown shades that are not ruddy of orangey, which is perfect for brows. As you can see from the swatches, the Light/Medium is a midtone grey brown, while the Medium/Dark shade is a neutral chocolate brown. For most of us Asian girls, the Medium/Dark shade would be the preferred choice, unless you dye your hair. One thing that really impressed me was how well it stayed on! It is billed as waterproof, and indeed it stays on, even when rubbed, so you'll definitely need makeup remover to get it off. Benefit's Gimme Brow swatches: Only two shades, but they're quite universal. If you're looking for an easy-to-use, long lasting brow product in wearable, realistic colours, then the Benefit Gimme Brow is one really worth checking out. Perhaps my only gripe is that it's a tad small (it's smaller than your average mascara), but since it's quite nicely pigmented, a little bit will probably go a long way. It will be available in October. Great review! Was thinking of buying Mac's brow set but I guess this one would work for me. Thanks for the review, guess I'll have to try it out! You said it lasts, but does this also mean it keeps eyebrows in place? My eyebrows always end up in every which way by the end of the day! @Mariah: Thank you for your question! It's more of a brow mascara, so just like how mascara coats your eyelashes, this product is meant to coat your brow hairs to make them look denser and have more volume, as well as deposit colour on your brows. So yes it will work to keep your hairs in place to some extent, because the brow product deposited helps to hold hairs in place, but it won't do it as well as, say, a wax product, where you use a solid wax to actually "glue" down some of your more troublesome hairs. I guess how well it works for you depends on how much strength you need to keep those brow hairs tidy! For me it's not too much of an issue, but if it is for you, maybe this combined with a wax-based product (Benefit recommends their own Brow Zings) might give that extra hold. Hope this helps!